From Indonesia to the United Kingdom, the mosque in its many forms is the quintessential Islamic building. The mosque, masjid in Arabic, is the Muslim gathering place for prayer. Masjid simply means “place of prostration.” Though most of the five daily prayers prescribed in Islam can take place anywhere, all men are required to gather together at the mosque for the Friday noon prayer. Mosques are also used throughout the week for prayer, study, or simply as a place for rest and reflection. The main mosque of a city, used for the Friday communal prayer, is called a jami masjid, literally meaning “Friday mosque,” but it is also sometimes called a congregational mosque in English. The style, layout, and decoration of a mosque can tell us a lot about Islam in general, but also about the period and region in which the mosque was constructed. The home of the Prophet Muhammad is considered the first mosque. His house, in Medina in modern-day Saudi Arabia, was a typical 7th-century Arabian style house, with a large courtyard surrounded by long rooms supported by columns. This style of mosque came to be known as a hypostyle mosque, meaning “many columns.” Most mosques built in Arab lands utilized this style for centuries. The architecture of a mosque is shaped most strongly by the regional traditions of the time and place where it was built. As a result, style, layout, and decoration can vary greatly. Nevertheless, because of the common function of the mosque as a place of congregational prayer, certain architectural features appear in mosques all over the world. The most fundamental necessity of congregational mosque architecture is that it be able to hold the entire male population of a city or town (women are welcome to attend Friday prayers, but not required to do so). To that end congregational mosques must have a large prayer hall. In many mosques this is adjoined to an open courtyard, called a sahn. Within the courtyard one often finds a fountain, its waters both a welcome respite in hot lands, and important for the ablutions (ritual cleansing) done before prayer. 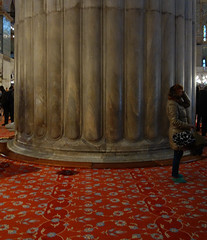 Another essential element of a mosque’s architecture is a mihrab—a niche in the wall that indicates the direction of Mecca, towards which all Muslims pray. Mecca is the city in which the Prophet Muhammad was born, and the home of the most important Islamic site, the Kaaba. 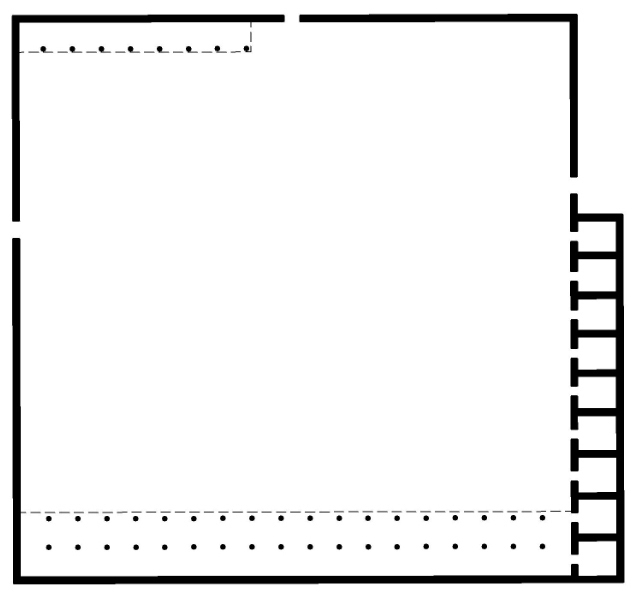 The direction of Mecca is called the qibla, and so the wall in which the mihrab is set is called the qibla wall. No matter where a mosque is, its mihrab indicates the direction of Mecca (or as near that direction as science and geography were able to place it). Therefore, a mihrab in India will be to the west, while a one in Egypt will be to the east. 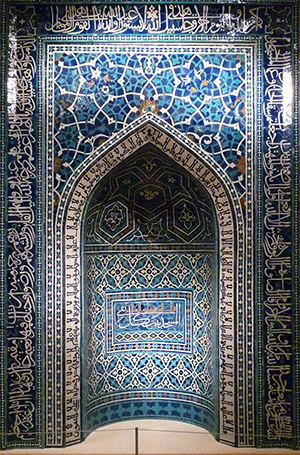 A mihrab is usually a relatively shallow niche, as in the example from Egypt, above. 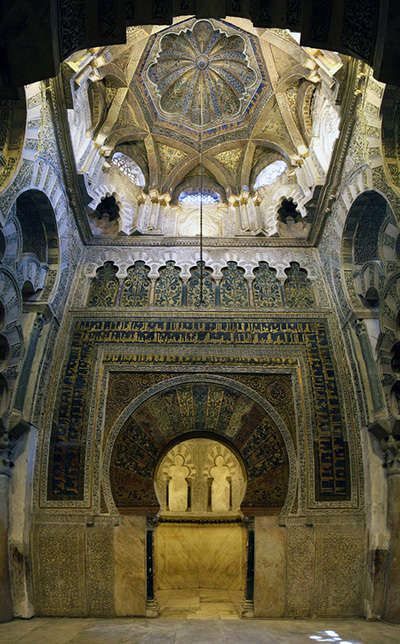 In the example from Spain, shown right, the mihrab’s niche takes the form of a small room, this is more rare. 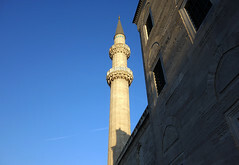 One of the most visible aspects of mosque architecture is the minaret, a tower adjacent or attached to a mosque, from which the call to prayer is announced. 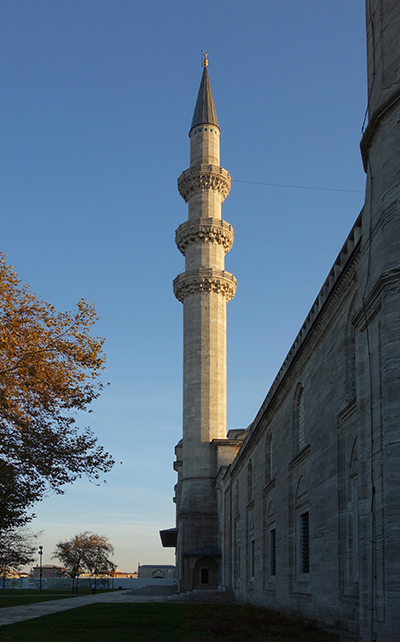 Minarets take many different forms—from the famous spiral minaret of Samarra, to the tall, pencil minarets of Ottoman Turkey. Not solely functional in nature, the minaret serves as a powerful visual reminder of the presence of Islam. Most mosques also feature one or more domes, called qubba in Arabic. While not a ritual requirement like the mihrab, a dome does possess significance within the mosque—as a symbolic representation of the vault of heaven. The interior decoration of a dome often emphasizes this symbolism, using intricate geometric, stellate, or vegetal motifs to create breathtaking patterns meant to awe and inspire. 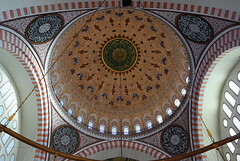 Some mosque types incorporate multiple domes into their architecture (as in the Ottoman Süleymaniye Mosque pictured at the top of the page), while others only feature one. In mosques with only a single dome, it is invariably found surmounting the qibla wall, the holiest section of the mosque. The Great Mosque of Kairouan, in Tunisia (not pictured) has three domes: one atop the minaret, one above the entrance to the prayer hall, and one above the qibla wall. Because it is the directional focus of prayer, the qibla wall, with its mihrab and minbar, is often the most ornately decorated area of a mosque. 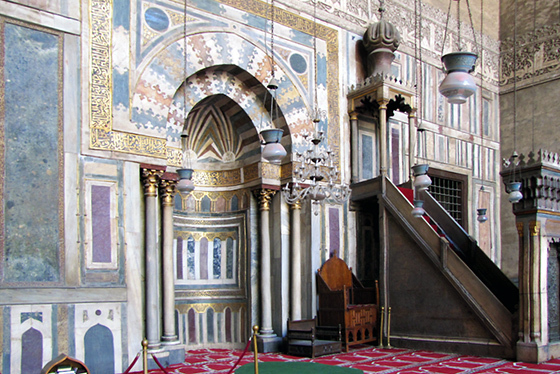 The rich decoration of the qibla wall is apparent in this image of the mihrab and minbar of the Mosque of Sultan Hasan in Cairo, Egypt (see image higher on the page). There are other decorative elements common to most mosques. 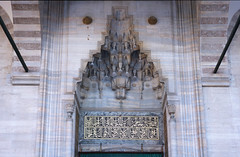 For instance, a large calligraphic frieze or a cartouche with a prominent inscription often appears above the mihrab. 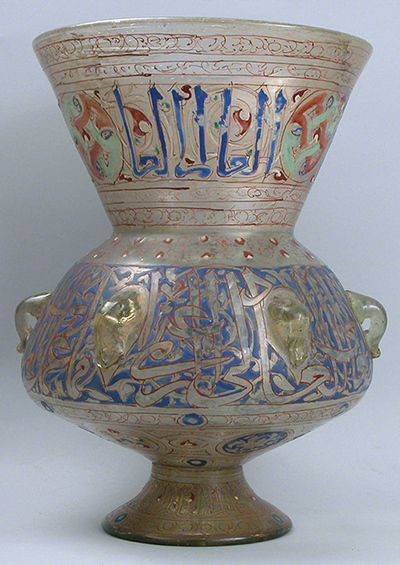 In most cases the calligraphic inscriptions are quotations from the Qur’an, and often include the date of the building’s dedication and the name of the patron. 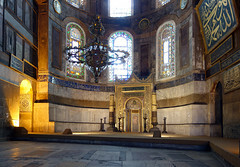 Another important feature of mosque decoration are hanging lamps, also visible in the photograph of the Sultan Hasan mosque. Light is an essential feature for mosques, since the first and last daily prayers occur before the sun rises and after the sun sets. Before electricity, mosques were illuminated with oil lamps. Hundreds of such lamps hung inside a mosque would create a glittering spectacle, with soft light emanating from each, highlighting the calligraphy and other decorations on the lamps’ surfaces. Although not a permanent part of a mosque building, lamps, along with other furnishings like carpets, formed a significant—though ephemeral—aspect of mosque architecture. Most historical mosques are not stand-alone buildings. Many incorporated charitable institutions like soup kitchens, hospitals, and schools. Some mosque patrons also chose to include their own mausoleum as part of their mosque complex. The endowment of charitable institutions is an important aspect of Islamic culture, due in part to the third pillar of Islam, which calls for Muslims to donate a portion of their income to the poor. The patronage of mosques was not only a charitable act therefore, but also, like architectural patronage in all cultures, an opportunity for self-promotion. The social services attached the mosques of the Ottoman sultans are some of the most extensive of their type. 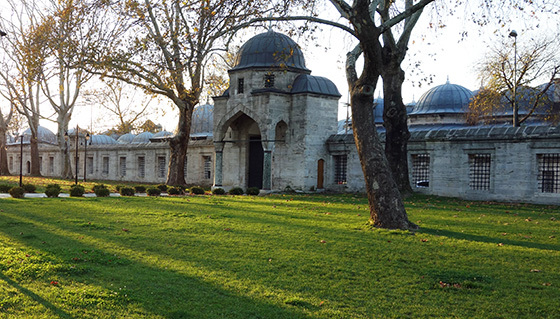 In Ottoman Turkey the complex surrounding a mosque is called a kulliye. 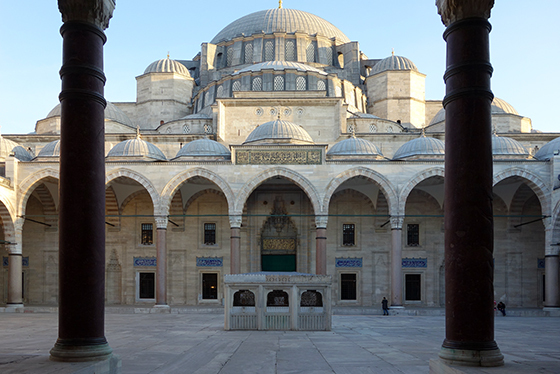 The kulliye of the Mosque of Sultan Suleyman, in Istanbul, is a fine example of this phenomenon, comprising a soup kitchen, a hospital, several schools, public baths, and a caravanserai (similar to a hostel for travelers). 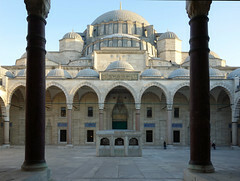 The complex also includes two mausoleums for Sultan Suleyman and his family members. Cite this page as: Kendra Weisbin, "Introduction to mosque architecture," in Smarthistory, August 8, 2015, accessed April 19, 2019, https://smarthistory.org/introduction-to-mosque-architecture/.